09 « February « 2012 « Nothing in Biology Makes Sense! Why grow thorns if they don’t work? This post is a guest contribution by Colin Beale, a research fellow at the University of York who studies ecology in Tanzania. Colin writes about the living community of the savannah, from butterflies to wildebeests, with co-blogger Ethan Kinsey at Safari Ecology. If you have an idea for a post, and you’d like to contribute to Nothing in Biology Makes Sense, e-mail Jeremy to inquire. Giraffes lick leaves from between the thorns. Spinescent. Now there’s a word! 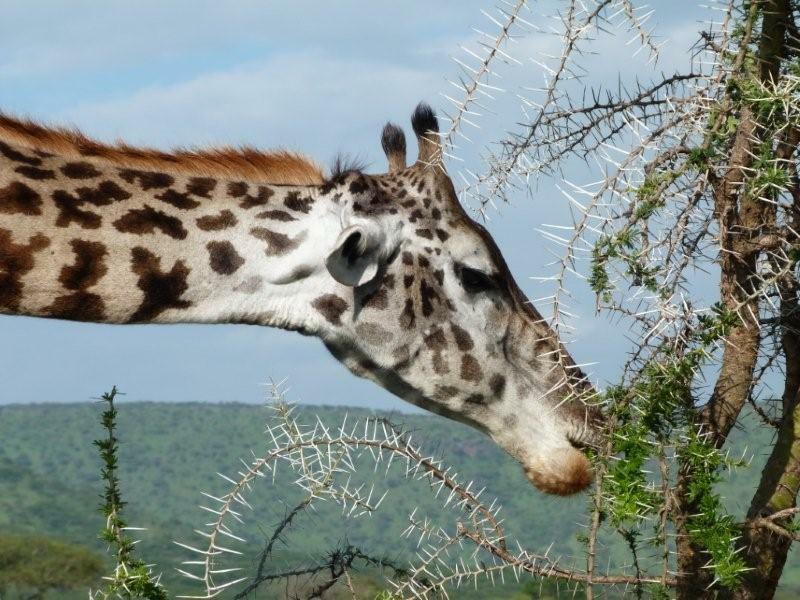 It simply means having spines and one of the first things many visitors to the African savannah notice is that everything is covered in thorns. Or, in other words, Africa is spinescent. It’s not a wise idea to brush past a bush when you’re walking, and you certainly want to keep arms and legs inside a car through narrow tracks. These are thorns that puncture heavy-duty car tyres, let alone delicate skin. But why is the savanna so much thornier than many of the places visitors come from? Or even than other biomes within Africa, such as the forests? At one level the answer is obvious—there are an awful lot of animals that like to eat bushes and trees in the savanna. Any tree that wants to avoid this would probably be well advised to grow thorns or have some other type of defence mechanism to protect itself. But then again, perhaps the answer isn’t so obvious: all those animals that like to eat bushes seem to be eating the bushes perfectly happily despite the thorns. So why bother having thorns in the first place? There’s certainly a serious cost to having thorns: plants that don’t need to grow them have been shown in experiments to produce more fruits. So if animals eat the plants with thorns anyway, why pay this cost?